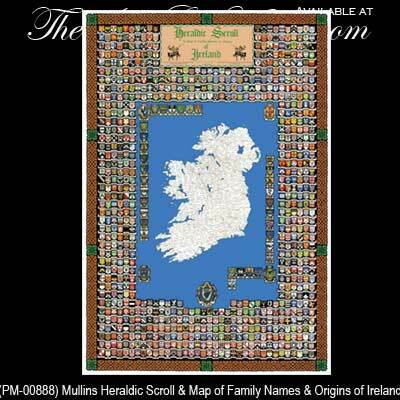 The Mullins Irish names map features 780 Irish coat of arms in full color. Sorry, the Mullins Map is now out of print. Please consider the Irish names map from McCourt. This Irish names map is the Mullins Heraldic Scroll of Ireland which provides full color coat of arms for 780 Irish families along with the family location origins on a detailed map of Ireland. The coat of arms for the four provinces of Ireland along with the coat of arms for the 32 counties of Ireland is included. This illustrated Irish names map measures 40” tall x 27” wide (unfolded) and the poster is printed on heavy stock. The Mullins Irish names map is suitable for framing. The Mullins Heraldic Scroll and Map was first printed in 1968 after each of the 780 family coats of arms were hand painted by internationally renowned Heraldic Artist, the late Mr. Richard Kelly, the project took him over 5 years to complete. For over 40 years craftsmen and women have referred to The Mullins Heraldic Scroll as their Heraldic Bible and it enabled them to make family wall plaques, engravings and embroidered patches of the family coats of arms. In addition to the 780 Irish family coats of arms, the map has the coats of arms for Ireland’s Counties and Provinces.